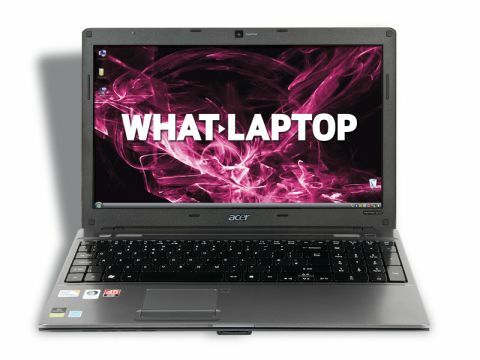 As one of the world's largest laptop manufacturers, Acer's machines are among the best you can buy. The Aspire 5810TG-354G32Mn is one of its more portable machines and offers stunning graphics power, but proves unfortunately limited in some key areas. At just 2.4kg this is the second lightest laptop in this group test, with sleek dimensions that make it very comfortable to carry. As a result, we were disappointed to find a battery life of just 181 minutes – an extremely average result. More pleasingly, build quality is excellent and up to Acer's usual standards. The resilient plastics and gun-metal colour scheme create a high-quality feel that belies the low price tag. All panels are firmly fixed, so this is a machine that is sure to withstand the test of time. This quality is continued across the keyboard. Using a design unique to Acer machines, each key is widely spaced and raised above the chassis' surface. The flat profile may not suit all users, but we found it very responsive and comfortable to use. A full numeric keypad on the keyboard's right-hand side lets you quickly input data into spreadsheets, while a range of dual-function buttons provide basic multimedia functionality for quickly controlling your music, movies and photo slideshows. Where the Acer vastly outperforms its rivals is its graphics power. Using a dedicated ATi HD 4330 graphics card, performance is stunning. Frequent and demanding photo or video editing and mid-level gaming are possible, making this a surprisingly capable multimedia machine. This is aided by the excellent 15.6-inch screen. While it is not as bright as we would have liked, images are sharp and vibrant. The 16:9 widescreen aspect ratio is ideal for watching movies and this is also the only laptop here to feature an HDMI port for connecting to an HDTV. Unfortunately, office performance is less impressive and we found the single core Intel Core 2 Solo processor struggled slightly when multi-tasking. It more than suffices for basic daily use, however. One area that the Acer falls short of its rivals is its Windows Vista operating system (OS). Vista is much older than the Windows 7 OS installed on all other laptops here and is known for being very unreliable, so you may wish to upgrade to Windows 7 - discs cost around £70 (inc. VAT) online. Despite its poor choice of OS and limited battery, the Aspire 5810TG-354G32Mn's fantastic design, usability and graphics performance ably compensate. As long as you're not planning to hit the road too often, the power and features on offer here will easily fulfil most needs.